UPDATED: Sat., July 8, 2017, 5:58 p.m.
NASHVILLE, Tenn. – For the first time ever, the United States failed to win its CONCACAF Gold Cup opener. Blame this disappointing result on an inability to protect a lead. 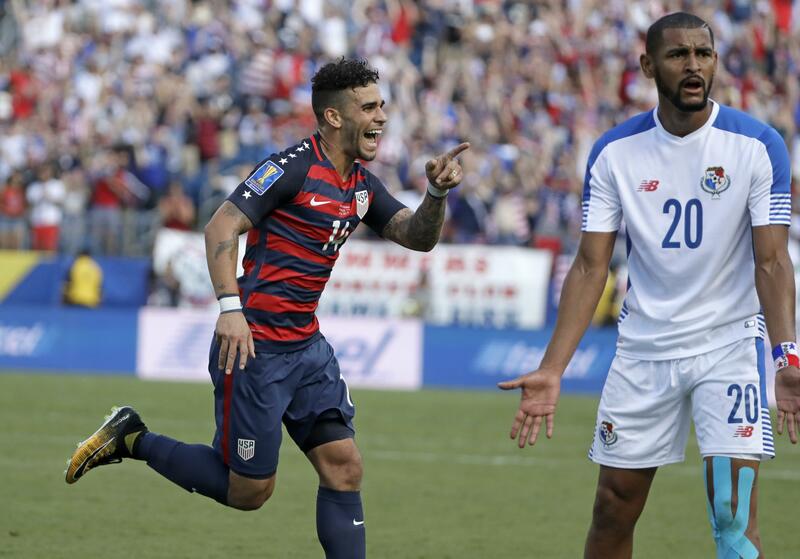 Dom Dwyer scored for the second straight game but Miguel Camargo’s goal gave Panama a 1-1 tie Saturday, ending a streak of 13 straight wins by the Americans in their opener of soccer’s North and Central American and Caribbean championship. Camargo’s 60th-minute goal capped a dominant 10-minute stretch for Panama after Dwyer had put the U.S. ahead. After getting a goal in his American debut last weekend against Ghana , the England-born Dwyer scored in the 50th minute with a left-footed shot from 9 yards that went in off the far post. Dwyer, the husband of U.S. women’s team forward Sydney Leroux , ran onto a cross from Kelyn Rowe following a throw-in by Jorge Villafana. Dwyer joined teammate Paul Arriola in scoring goals in his first two international matches, a feat accomplished by nine Americans since 1916. Panama put on immediate pressure and scored after Rowe was beating down the flank and Edgar Barcena crossed to Gabriel Torres. Brad Guzan saved his initial shot but Camargo sent a rebound past the goalkeeper’s outstretched right hand . “It just comes down to a lapse of concentration,” Bedoya said. The U.S. dropped to 30-1-4 in Gold Cup group-stage play, with the lone defeat against Los Canaleros in 2011. The last four matches between the U.S. and Panama have ended in 1-1 ties. Next up for the U.S. is a Wednesday match against Martinique in Tampa, Florida. The Americans finish group play next Saturday against Nicaragua in Cleveland. Like most nations, the U.S. is not using many top players in the 12-team tournament, preferring to test its junior varsity before World Cup qualifying resumes in September. Just six players started from the among the 22 who opened the March qualifier between the teams in Panama City, including American center back Omar Gonzalez and Villafana. On an afternoon with temperatures in the high 80s, there was a hydration break in the first half and action slowed in the latter stages. The crowd of 47,622 was the largest for a soccer match in Tennessee. Camargo’s goal was his second for the national team. He also scored against Chile last year in the Copa America at Philadelphia. Panama nearly tied the game five minutes before Camargo’s equalizer. Torres’ header was saved by Guzan with his left hand, and Ismael Diaz’s effort off the rebound sailed high. The U.S. is winless in its last three Gold Cup matches, its longest skid. The U.S. lost to Jamaica in the 2015 semifinals and dropped the third-place game to Panama on penalty kicks. Bedoya and Gonzalez started in place of Arriola and Matt Hedges. Midfielder Dax McCarty made his first competitive appearance after playing in seven exhibition games since 2009. Major League Soccer commissioner Don Garber was on hand. Nashville is among the cities hoping to get an MLS expansion team. Published: July 8, 2017, 4:08 p.m. Updated: July 8, 2017, 5:58 p.m.